Now we’re nearing the Spring and Summer months, the trend which is dominating the hair world is the chop. We don’t mean short hair – but medium, sassy bobs which fall roughly around the shoulder length. Medium length hair has never been more popular! If you’re blonde, there are a range of stunning medium hairstyles you would suit. We’ve gathered 10 absolutely incredible medium length blonde hairstyles. Each of these will breathe life into your hair. 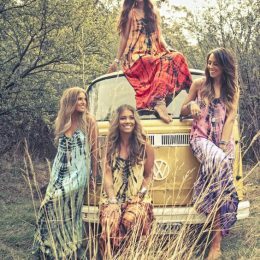 They will give you a perfect new look for the new season. Let’s go! We’re starting strong with this blonde balayage medium bob! Start by getting your hair cut into a medium bob. Make sure the layers are slightly longer at the front of the face and shorter at the back. Cut a side fringe in if you wish. For colour, opt for a dark caramel blonde all over. Add a sunkissed effect with bright blonde highlights scattered around the front of the face and throughout the hair. Another beautiful blonde bob, but this time a little shorter. Recreate by chopping your locks to an inch or so below your chin. Opt for a deep side parting to create this fabulous swept fringe effect. Add lots of light blonde highlights, focusing around the front of the hair. Use straighteners to fill your hair with tight curls for this fantastic bouncy end result. Ringlets will add the perfect amount of light and lift to your cut – so embrace them! 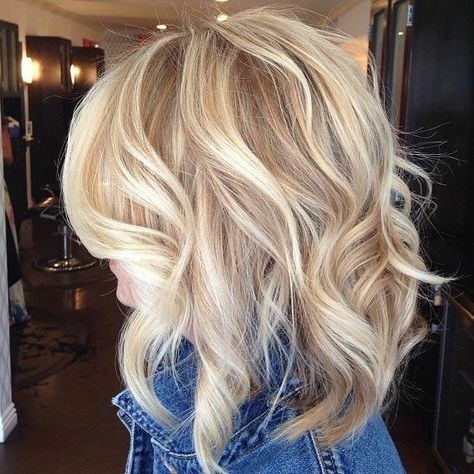 Recreate this stunning sun-kissed style by opting for a medium length bob. Add lots of feathered layers throughout the hair to create a stunning silhouette. Choose a range of golden blonde highlights – bright and caramel toned. This will create a stunning blonde look. Finish with ringlets throughout! Of course, blonde bobs also look amazing when straight too! Chop your hair into a bob that falls an inch or so above shoulder length. Part your hair in the centre. Make sure there are choppy layers around the front for the perfect finish. Keep your hair straight, but loosely tousle it with your fingers. 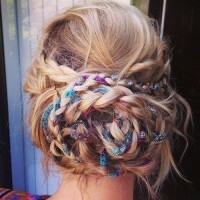 Add texture to the front of the hair for this amazing end result. Cute shoulder length bobs are perfect day to night hairstyles. This stunning bob is cut a few inches below the jaw. Dye your hair a bright blonde shade of your choice. To recreate the look above, stick to one shade for a golden blonde glow. Straighten your hair but curl the ends underneath. This will give you an immaculate end result which is super stylish. 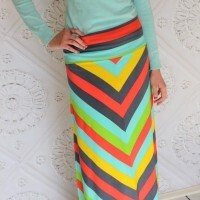 Want a look which is perfect for work? 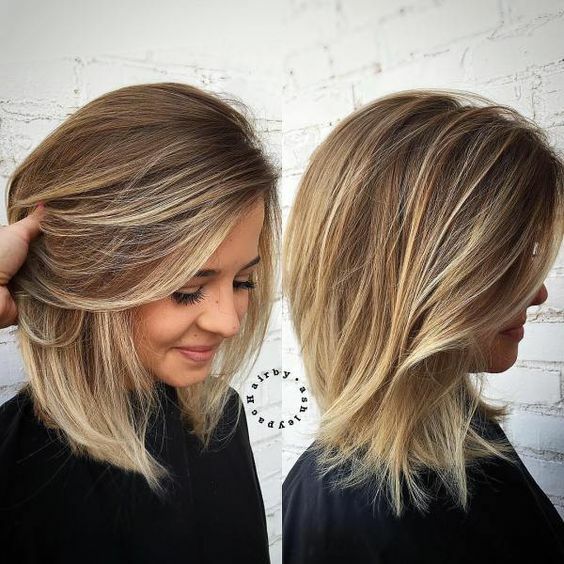 Recreate this beautiful mid length bob! Cut your hair above the shoulder length. Keep the layers slightly longer towards the front of the face in a cool, graduated style. Opt for lots of luscious blonde highlights to add light and lift to the style. Keep it straight and sleek, slightly curling the ends under for sophistication. For a slightly longer look which is still so fashionable, cut your hair just below the shoulder length. Opt for a gorgeous and warm golden blonde colour all over. Add highlights if you wish! 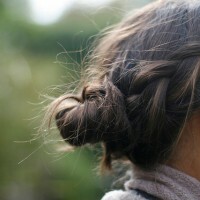 Keep your hair parted in the centre. Add big barrel curls from top to bottom. With your fingers, loosely tousle the curls to create this voluminous and dramatic end result. Balayage is a trend which works incredible well with blonde hair, as you can see here. Keep your hair mid length, around the shoulders. Add soft layers throughout the top of the hair. Start with your natural colour at the root. 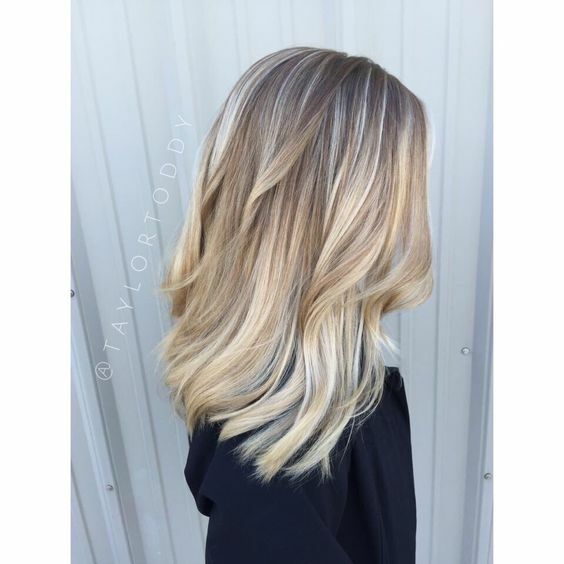 Using the balayage technique, blend white blonde highlights throughout the end for a sun-kissed finish. Add loose curls throughout to show of the transition. Soft waves bring a hairstyle to life in a subtle yet fashionable way. Chop your locks to sit perfectly around the shoulder. Keep the ends one length. Part your hair to the side and choose a fun and vibrant shade of blonde for all over. You can add some highlights if you wish! Using straighteners, add lots of curls throughout the hair and gently pull them out. 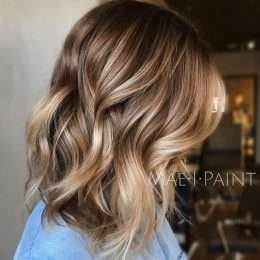 Ombre is another incredible hair technique that works perfectly with medium length hairstyles. Recreate this look by starting with dark blonde at the top and blending to light blonde. Using the ombre technique, you should get two colours together perfectly. Add lots of bouncy curls all over and tousle them for this fun and fancy finished result. Which of these stunning blonde medium hairstyles is your favourite? Let us know what you’d like to see next on Styles Weekly!